Things are a bit hectic at the red thread HQ at the moment. On Saturday week (1st May) I have the Craft Room class to teach, then the following day is Mathilda's Market at Riverview. And 2 days after that I'm heading to Melbourne for 5 days for the Stitches & Craft Show. So the next 2 weeks are going to be busy with all I need to do in preparation. Here's a little peek at what I've been up to. 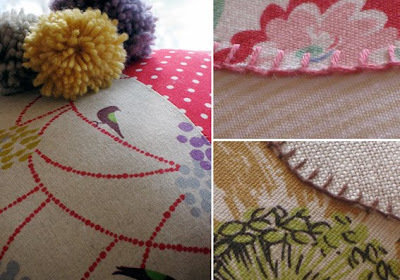 Some sewing, pom pom making and blanket stitching. Logo design, pattern design and more sewing. 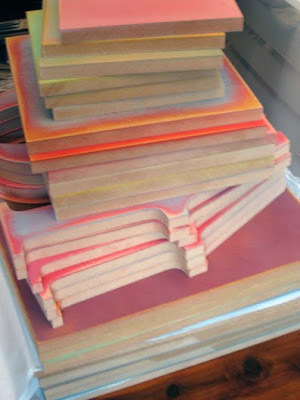 Painting timber for a new range of Vintage Storybook Tiles, and a new product. 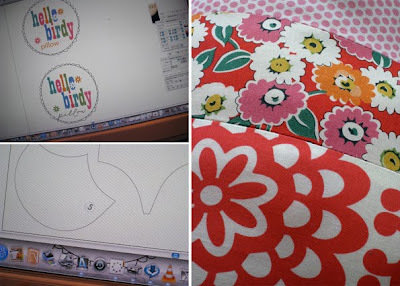 I'm working on a couple of new things for Mathilda's and 2 - or possibly 3 if I can manage it - new kits/patterns for Stitches & Craft. Jodie, Kristen and Claire seem to be way more organised than I am for S&C... to be honest, watching Jodie's organisation, hard work and prep for the show has made me feel a bit anxious! It looks like it is going to be a fantastic show with so much to do and see. Of course the incubator is going to be full of creative and crafty types selling their fab creations. There is a lot organised for the show, and you can check it all out in their 60 page show guide. Yes, 60 pages of good stuff! I might need to find a helper or two so I can have a few hours off to enjoy the show and do some shopping.